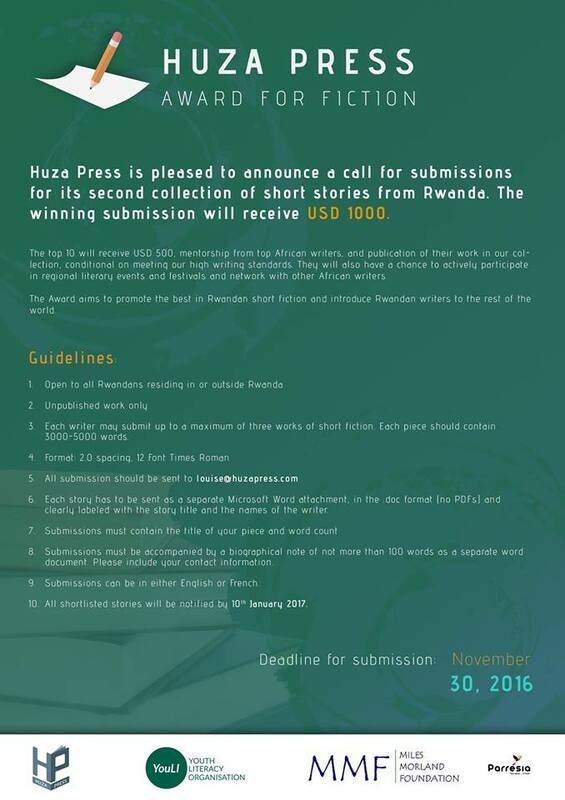 Rwandans are called to make their fiction submissions for the Huza Press Prize for Fiction 2016. Huza Press a new outfit out of Rwanda announced themselves to the African literary with a bang last year as they organized the first known writing competition in the history of the Eastern African nation. The prize started with a call out was for short stories, all unpublished work, that would end up in an anthology that would come out later in the year. The best story would get a cash reward of US$1,000 and the best ten will be mentored by some of the best writers on the continent. All of them will participate in regional literary festivals, think Writivism, Storymoja et al. And true to their word, they delivered as first there was a glittering ceremony in Kigali where they handed out the prize to two joint winners Darla Rudakubana and Daniel Rafiki. They went home with US$500 for their stories Of Fear and of Guilt and Versus respectively. We then met these writers in August as they attended the Writivism Festival as they read their stories in session. It looks like the second edition of the prize is in the works and Rwandan writers are invited to get onto the best literary ride going them. Huza Press have announced that they are excited to announce a call for submissions for the second annual Huza Press Prize for Fiction. There are changes this year in the format. For one, they will be handing out US$500 to each of the 10 shortlisted writers in the competition while the winner goes home with US$1,000. Not bad for what could be considered as an amateur prize at best in only its second year. Apart from the money, they will also get mentored by some of the leading writers around as well as attend certain literary events on the prize’s bill. If you feel like this is your thing then I suggest that you email your submission to louise@huzapress.com. Please note that deadline for submission is November 30, 2016. The details of terms and conditions can be found in the poster in this post. This is a gorgeous competition. I have been waiting for this opportunity. Thanks a lot @Huzapress for amplifying the voice of Rwandan emerging writers. That is my opportune moment to show the world what I was born to do.